Present state: Main station building is extant and is now a private residence, it is largely unaltered. The south end of the platforms are extant but the track bed has been filled in up to platform level. 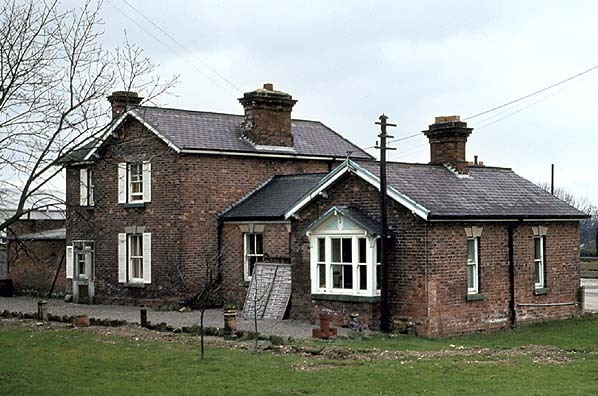 The station building is very similar to that at Masham and is a substantial brick structure on the platform comprising a two storey stationmaster's house and a single storey booking office and waiting room. 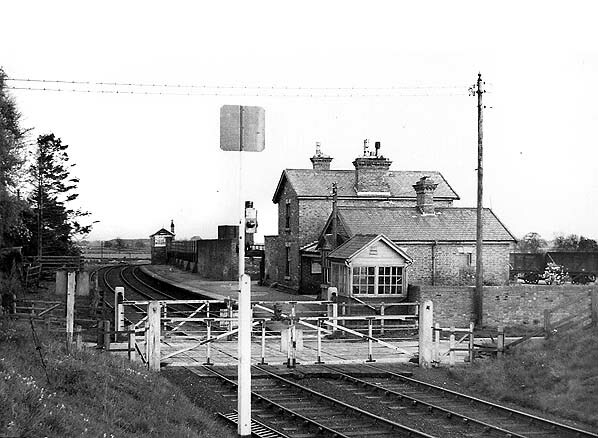 Although there was a loop at the station there was only one platform: the loop acted as a siding and served a cattle dock adjacent to the level crossing with a cattle pen alongside. The goods yard was on the up side of the line behind the station and comprised three sidings, one serving a goods dock and a further siding and loop serving coal drops located behind a high brick wall on the platform. A signal box to control both the goods yard and the crossing was located on the platform behind the coal drops and a second signal box was later added as the west end of the platform adjacent to the crossing. The station had a 3-ton crane between the sidings but no goods shed. 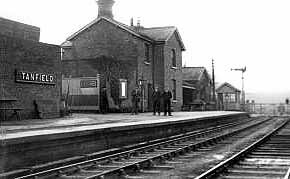 After closure to passengers in 1931 the station remained open for goods traffic. During WW2 the station acted as a transhipment point for munitions stored locally during the build up to D-Day. To handle this extra traffic the army provided additional staff to help the two railway employees. 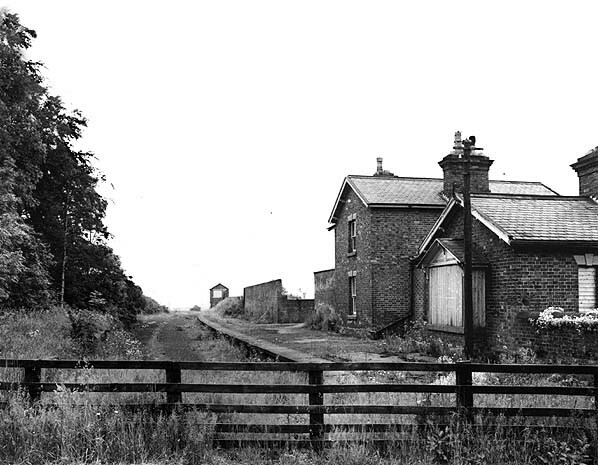 The first scheme for a station near the small market town of Masham in Wensleydale, North Yorkshire, was proposed by the Northern Counties Union Railway, an amalgamation of other local projects and promoters, for a 127 mile line from the Leeds & Thirsk Railway at Melmerby to Leyburn, Hawes, Kirkby Stephen and Appleby and on to a junction with the Lancaster & Carlisle Railway south of Clifton. At Kirkby Stephen, there would be a junction with the Stainmore line running between Bishop Auckland and Tebay. Although the company received its Act on 27th July 1846, the scheme was doomed to failure owing to unworkable clauses being inserted into the Bill at the instigation of the London & North Western Railway and Lancaster & Carlisle Railway who did not want the line to be built, and also opposition from the Duke of Cleveland who was reluctant to sell the company a vital strip of land. Despite this opposition, a total of 2 ¼ miles was completed, including a section of earthworks north of Melmerby which was sold to the Leeds & Thirsk Railway for their extension to Stockton. Midland Railway who were planning to build their own line to Hawes. Eventually agreement was reached, and the Hawes & Melmerby Railway was incorporated in 1865 with 50% of the capital being provided by the NER. Once again, parliamentary approval was given but, like its predecessor, this scheme also failed when allegations of financial irregularities were made against the NER board in 1867. Although these allegations were proved to be groundless, the board decided that economies should be made. A number of schemes were postponed, including the Hawes & Melmerby, where work was due to start in 1868. When the Midland also expressed doubts about its involvement with the line the whole scheme was in jeopardy, as the time limit imposed by parliament for starting work was due to expire in 1869. By now the promoters were worried that the line would never be financially viable as it was running through sparsely populated countryside between Leyburn and Melmerby with little hope of attracting much traffic. The NER decided to abandon the line in favour of a branch line to Leyburn and Hawes from Northallerton. The Hawes and Melmerby board agreed to this on condition that the NER built a 7½ mile branch from Melmerby to Masham at their own expense. This was agreed, and the Hawes & Melmerby Company was wound up. The branch was authorised by the NER Act of 1871 and a contract for the construction was awarded to Scott & Edwards who had submitted the lowest tender in October 1872; work started the following year. 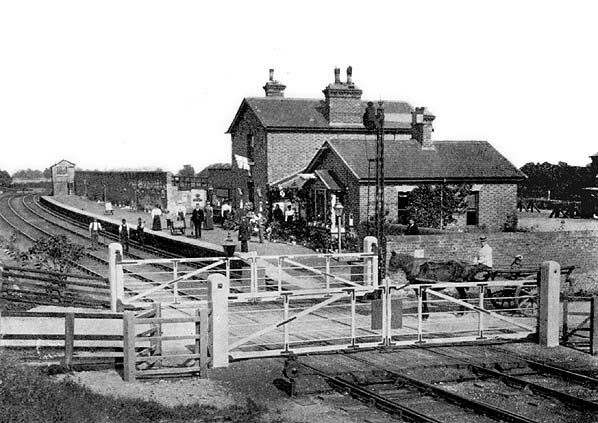 The single track branch line officially opened on 9th June 1875 and the first passenger trains ran the following day. There was one intermediate station at Tanfield. An engine shed for two locomotives with watering and coaling facilities was provided in the goods yard at Masham. 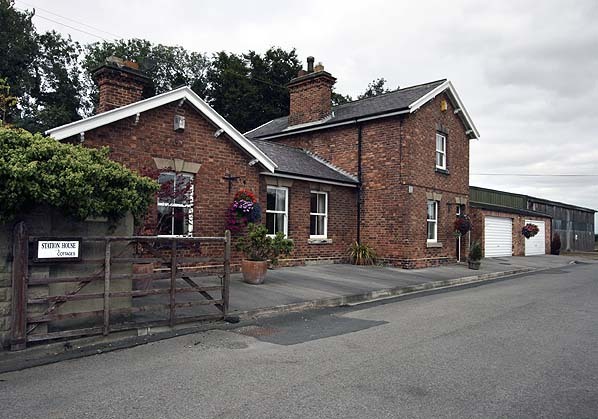 The line never attracted much passenger or freight traffic although Masham station was convenient for visitors to Jervaulx Abbey, Swinton Park and the beautiful woods and walks of Hackfall. In 1901 the NER estimated that Masham served a local population of 3,642, while Tanfield’s catchment was 1,274. In 1911 these stations issued 15,141 and 7,494 tickets respectively. The 1898 NER working timetable shows four passenger trains a day between Ripon and Masham with a daily train for livestock in the morning and a mixed goods train in the afternoon. Additional freight traffic was generated in the early 20th century when a 6-mile long 2ft gauge contractors' railway was built from Masham to serve Roundhill reservoir which was being built by Harrogate Corporation to the west of the town. This line was also used by Leeds Corporation who had their own scheme to build Leighton reservoir below Roundhill dam, and they agreed to buy the line once the Roundhill reservoir was complete. In April 1905 the two Corporations came to an agreement with the NER to provide transhipment sidings on the north side of the Masham to Melmerby road, opposite the station (which is on the south side). This required a siding in the goods yard to be extended across the road into the new transhipment area. The contractors’ railway ran through the villages of Fearby and Healey to Leighton Bridge and on to the construction sites. The Leeds reservoir construction started in 1908, and, on completion of the Roundhill reservoir in 1910, the narrow gauge line was purchased by Leeds Corporation. Shortly after the outbreak of WW1, the construction camp was commandeered for military use and was subsequently extended. Work on the reservoir stopped in 1915. The camp was used to house German prisoners of war, bringing additional traffic to both the narrow gauge line and the Masham branch. Work on Leighton reservoir resumed in 1919, and the narrow gauge line remained in situ until the early 1930s, some years after completion of the reservoir. There was one major accident on the Masham branch on Easter Monday 5th April 1926 when a down train was derailed on a long curve a mile to the west of Tanfield. There were some 30 passengers in three coaches, but fortunately no one suffered injury or even shock. The derailment was blamed on buckling of the track due to heat, as tight fishplates did not allow the rails to expand. been added at midday, returning to Ripon. It came as no surprise when the passenger service was withdrawn from 1st January 1931, although the branch remained open for goods traffic. WW2 brought a new lease of life to the branch which was used to transport munitions stored locally. This all came by rail rising from 4,000 tons in 1940 to 76,000 tons in 1944. During the build up to D-Day 42 trains were dispatched from Tanfield, each with up to 50 wagons. After the war, freight traffic returned to normal, consisting mainly of household coal and animal fodder on down trains with malt and agricultural produce being carried in the opposite direction. The line survived into BR days, but this came to an abrupt end when a question about the continued operation of the line was asked in Parliament. The answer given was that the main purpose of the line was to carry cans of water to certain cottages and to transport coal for the stationmaster at Masham to sell, which was a longstanding NER practice. The line closed completely on 11th November 1963, although nobody informed the Coal Board, and wagons of coal bound for Masham continued to arrive at Ripon for several days. Two further trips were made along the branch to deliver these and return the empties, so the actual final closure date was a week after the official date. 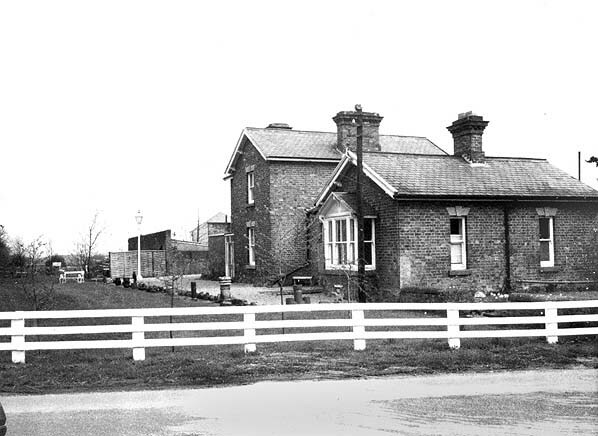 Tanfield station looking east, c.1905. The high wall at the back of the platform hides the coal drops. the level crossing. The signal seen in the picture above has gone. 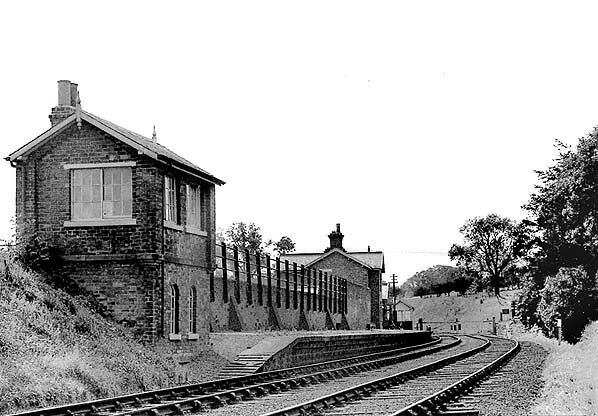 Tanfield station looking west in the 1950s.